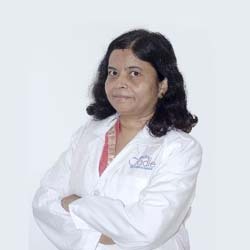 Dr Krishna shaw having 20 years of rich experience in Obstetrics & Gynecology and also in high risk pregnancies & infertility. Dr. Krishna Shaw had given me the best care for risk-free delivery. I and my baby are safe and are really grateful to the Apollo Cradle team. The nurses were very friendly and well-mannered. The interiors and decorations were so welcoming. Thanks! I had consulted gynaecologist Dr Krishna Shaw of the Apollo cradle, Koramangala in May. And I must say I am satisfied by the services I was provided with. The premises are clean and the staff is very helpful. The doctors are highly qualified and very friendly. They pay attention to concerns raised by you and help in eliminating your doubts. The nurses take very good care of you and make you feel comfortable. I consulted Dr Krishna Shaw of Apollo cradle, Koramangala in July for my delivery and I liked everything about it. The front office and PRO serve great in helping you choose a package and getting admitted timely. The ambulance service is very efficient and they drive with care. The best part is their team of doctors and nurses. They make your experience smooth and take utmost care in giving you the best treatment. I got admitted to the gynaecology and obstetrics department in the Apollo cradle, Koramangala for my delivery under the care of Dr Krishna Shaw. The staff was very empathetic in understanding all my needs. The doctors were knowledgeable and approachable with very less waiting time. The food quality was good and was delivered on time. Rooms were clean and hygienic. Billing and discharge formalities were also timely done. Overall, I am satisfied and will surely recommend Apollo to my friends and family. I would like to express my gratitude for all the help and support that was extended during my wife\\\’s delivery at Cradle Koramangala. My sincere thanks to all the Doctors and Nursing staff who made both the mother and the baby feel comfortable during the entire stay in the hospital. All the services are world class and we feel that the patient is in safe hands. Special thanks to our Doctor. All the very best and keep up the good work.